Ben Bac Sierra (center) holds press conference following the release of names of officers who fired at Alex Nieto. Photo by Daniel Hirsch. Friday Police released the names of the four officers directly involved in the March 2014 shooting of Alex Nieto: Officers Roger Morse, Nathan Chew, Richard Schiff, and Sergeant Jason Sawyer. The names were originally omitted from the public record because police argued that they had received threats against the officers’ lives. Those threats came from someone living abroad, according to police. A district judged ruled that the protective order that has kept the names of the officers restricted from public view was set to expire on Monday, January 5. The city had previously shared the names of the officers, as well as those of two additional officers who were present, with a lawyer representing the Nieto family. The District Attorney is investigating the case, as are the Office of Citizen Complaints and the SFPD’s internal affairs division. One of the officers listed in the Nieto case, Sgt. Sawyer, received a bronze medal of valor in 2007 or his involvement in a 1998 shooting of John Smart who allegedly pinned another officer, Ian Furminger, with a car, as the San Francisco Chronicle reported. Furminger is one of two officers recently convicted for corruption. Since the shooting of Nieto, Sawyer has transferred to Park Station. Officer Morse suffered minor injuries in 2008 when he and his partner’s cruiser crashed into a light pole, damaging an upstairs apartment window. According to statements made by police spokespeople, all four officers listed as involved in the Nieto shooting have returned to duty. The previously confidential names of two more officers involved in the shooting, but who did not fire guns, will also no longer be confidential when the protective order expires. In an email message to Mission Local, Adriana Camarena, an activist who has worked with the Nieto family, responded to the release of the officers’ names. At a press conference Monday afternoon held at the spot on the hill where Nieto was shot, friends, of the the 28-year-old as well as activists and the legal team representing the family gathered to mark the occasion and urge the city to be more forthcoming and transparent going forward. Nieto was shot at least ten times from multiple directions, according to a Medical Examiner’s report. Different accounts of the incident conflict – Nieto, a security guard, was carrying a Taser the night he was shot. Police Chief Greg Surh has said that Nieto aimed the Taser at officers who, seeing the laser sight of the weapon, fired in defense of their lives. In late August, however, lawyers for the Nieto family announced they had new testimony from eyewitnesses saying that Nieto never pointed his weapon at the officers. At Monday’s press conference, Bac Sierra reiterated this telling of the story. “Alex Nieto never pointed any taser at police officers. You insult our intellect and attempt to hurt us by spreading lies,” he said. When asked about Sunday’s officer-involved shooting outside of Mission Station, the attorney representing the family Adante Pointer expressed skepticism. He said that the first story coming from the police department is later challenged, as Pointer believes is the case in the shooting of Nieto. 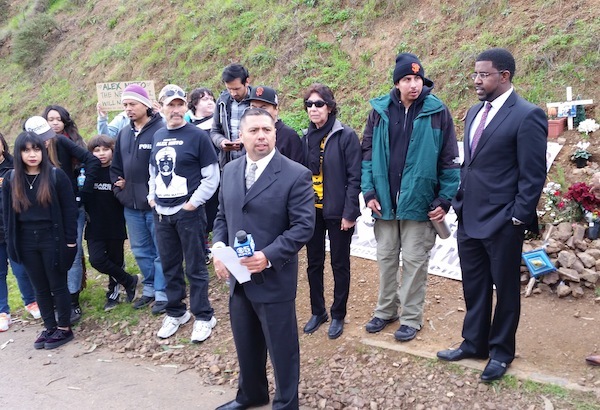 The Nieto family’s civil trial against the city and the police department is set for 2016. A version of this story was originally published on Friday, January 2.